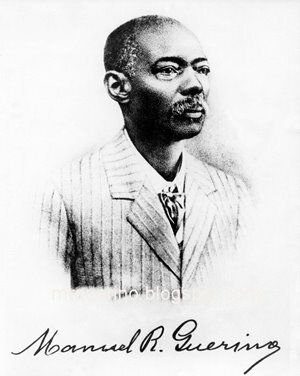 1868 Querino leaves Bahia and travels in the Northeast, possibly seeking to escape the draft, but is "recruited" in the province of Piauí. Because he was both literate (a rarity among the freeborn population) and slightly built, he became a clerk at his battalion's headquarters in Rio de Janeiro and rose to the rank of Squadron Corporal. 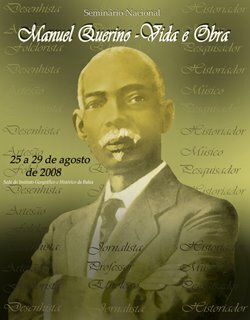 1885 Teaches geometric design at the Liceu de Artes e Ofícios da Bahia and the São Joaquim Orphanage School; becomes a member-benefactor of the Liceu; joins the abolitionist movement alongside Frederico Marinho de Araújo, Eduardo Carigé and others. 1928 A arte culinária published; on May 13, the IGHB hangs his portrait in its gallery of notables.